Russia has vetoed a UN Security Council resolution extending the mandate of the only official mission investigating the use of chemical weapons in Syria. The Joint Investigative Mechanism (JIM) was set up in 2015 to identify perpetrators of chemical attacks. It is due to report later this week on a deadly nerve agent attack on the town of Khan Sheikhoun in April. Russia has rejected a separate report from UN human rights investigators blaming the Syrian government. The JIM's mandate expires next month and Russia had been pushing to postpone a vote on its extension until after the report on Khan Sheikhoun was considered. But Russia could not get enough support and instead used its veto to block adoption. Russia, along with the UK, China, France and the US, have veto powers at the Security Council. It is the ninth time Russia has blocked action against its ally Syria, something rights group Amnesty called "a green light for war crimes". The US Ambassador to the UN, Nikki Haley, was also scathing, accusing Russia of siding with "dictators and terrorists". But Russian ambassador Vasily Nebenzia accused the US and others of trying to embarrass Russia. "What is taking place today is not very pleasant, it stinks in fact," he said, adding that Russia was prepared to discuss the JIM after the report's publication. The JIM, which involves the UN and the Organisation for the Prohibition of Chemical Weapons, is the only formal means of investigating chemical weapons attacks in Syria. At its founding it was hoped it could help lead to prosecutions. The attack on Khan Sheikhoun in April left more than 80 people dead and prompted the US to launch missile strikes on a Syrian airbase. 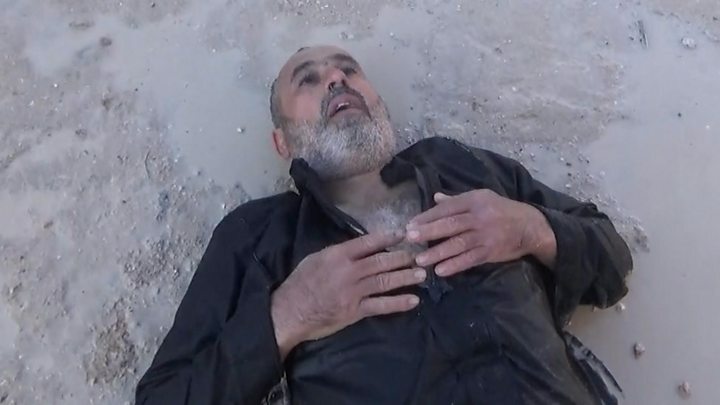 Last month a UN Human Rights Council inquiry concluded a Syrian air force jet was responsible, dismissing statements from Russia that the jet had dropped conventional munitions that struck a rebel chemical weapons depot. He has insisted Syria destroyed its chemical stockpiles under a deal brokered after another deadly attack near Damascus in 2013 although this year the US defence secretary said there was "no doubt" it had retained some.